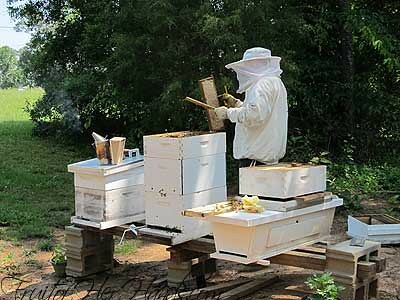 We have nine beehives now – isn’t that amazing? Things got insanely busy after my last post about them and I never posted an update. It has been amazing to watch as God has sent us so many colonies this year. We have nine right now, and a client of Stephen’s wants him to come trap a colony out of his garage soon too. Today was such an adventure. A swarm of honeybees landed in a tree right by our house, not 20 feet outside our door. Since we didn’t have to go anywhere, I was able to take a LOT of pictures. There were so many bees! While most of the bees went right into the top bar hive, there was still a fairly large clump of bees in the bushes. They fell there when the branch was first cut. From their behavior, we’re not sure if there’s a second queen in there or if they just never joined the first group. We’ve heard of swarms with more than one queen, so we’re hoping that’s the case here. Stephen set a 5 frame nuc there with bait inside to see what they’d do, and by dusk, they were marching right into that hive just like they did the top bar hive. We’ll know more tomorrow when it’s light out again and Stephen can go into the hive. We have had three traditional Langstroh hives. Stephen has been experimenting with one of them, trying to see if the bees in it will move into a top bar hive. It’s been fascinating to watch, but that’s another post for another day. 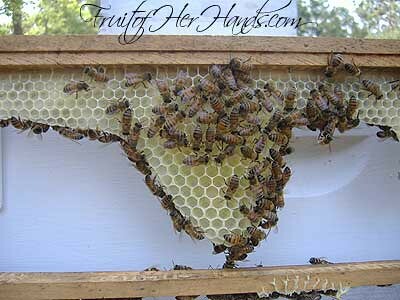 We also have a full size top bar hive, but haven’t had a chance to use it until now. We were waiting to either buy a package of bees or catch a swarm. . .and here God sent us a swarm. It was a very interesting afternoon, to say the least. I even suited up and went out to take pictures. I got some neat video too but can’t seem to find the program on my computer I always used to edit video with. . .so until I find something, the videos will have to wait. We’ve been praying for a swarm call, but this was even better. We didn’t have to go anywhere! Stephen and I each got an email this morning with our beekeeping test scores. We both passed. 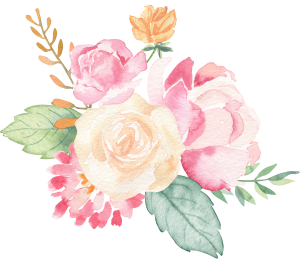 I am so excited – parts of the test were really easy, but there were a few parts of it that threw me a little. It was a relief to find out how I did. 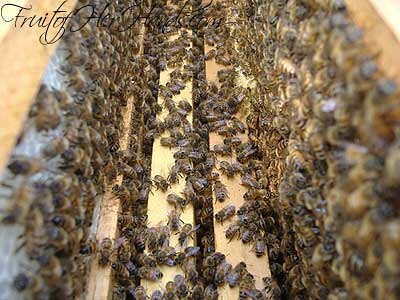 This beekeeping is addictive though. 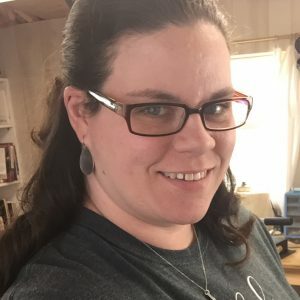 . .
By MelodyIn Bees2 Comments on I passed! It’s definitely spring – wow – is the pollen count through the roof or what?!? It’s been so beautiful out lately. It makes me just want to stay outside all day, but of course that doesn’t happen. There’s too much to do inside. Sunday our church is having Homecoming, and then revival with Bro. Alfred Willis all week. I am so excited. Services have been SO good at church lately, and the Holy Spirit has really been working on my heart, showing me where I need to change and grow. I’m definitely looking forward to the services. If you’re in the area and would like to come to services, send me an email for details! On the home front, Samuel has spring fever and is ready for school to be out. To be honest, this mommy is ready for a break too. :O) We are almost done for the year so break time is coming. My parents are also coming for a visit in the next couple of weeks so we’ll have that week off too. Our rabbit had babies – 7 of them. They’re about 3 weeks old now and are SO CUTE. They’ve just learned how to jump out of their nest box and it’s so fun to stand there watching them. Stephen and I also had our practical test for the bee school last Saturday. 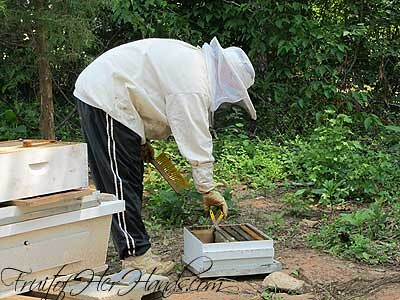 It’s the first step in the South Carolina Master Beekeeper Certification. I’d love to go farther with it but we’ll see. 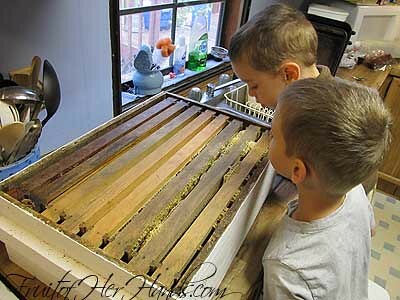 The last certification involves writing a book, and there’s only one Master Beekeeper in the state. . .It sounds like fun to pursue but honestly, probably not at this stage of life with our little ones. At least not for me, anyway. Little Miss Esther is teething already. At 5 months, her first two teeth are about to break through any day now. She is one miserable teether. Poor little girl. :O) But it looks like her teeth will be through tomorrow or the next day so hopefully she’ll have some relief then. We’ve also been making some pretty drastic changes to our diet. We’ve been trying to cut out all white processed food and sugars. One of the children (who shall remain unnamed) is so sensitive to sugar that we notice a dramatic change in behavior after eating it. Our first experiment is to eliminate all but the natural sugars and we’ll go from there. We’re also trying to eat as many whole foods as possible. It’s been a challenge, and here I was thinking we ate pretty well. Our garden is huge this year and we’re in the process of making it bigger. Lord willing, I’ll be able to put up enough tomatoes/sauce so that we don’t have to buy any over the winter. It’s a huge project but I’m hoping to be able to do it. Jewelry has been keeping me fairly busy as well. God has grown my little business and I am so thankful for that! I’ve added a Medical Alert Jewelry line and have quite a few other new design ideas as well. I’ve been trying my best to work the business during naptime/Family Quiet Time (more on that later if I can ever find the link again!) and when the kids are in bed. I don’t want my kids to think all I ever do is work on jewelry. But I have to admit it is a struggle sometimes. This post is plenty long enough now so I’ll quit. . .more later. . . Yesterday it was 80 here, so Stephen and I decided to go into the hives. I’ve stood next to him before as he’s gone through them, but never actually opened up the boxes myself. I was terrified. LOL! We have the top part of a bee suit but not the bottom. The last time I was stung by a bee, it was when one flew up my skirt. So yesterday, the only thing I was worried about was that I’d be holding a frame full of bees and that a bee would fly up my skirt and sting me. It didn’t happen though. I was very relieved. The bee suit is miles too big for me, but hey, it works. It even fit me last summer when I was 9 months pregnant with Esther. I’m just thankful to have one though. The beekeeping class we’ve been taking has been fascinating. I really enjoyed going through the hives yesterday. We saw honey already too. . .which is good – we’re already getting requests for our honey this year. At this rate, if we were keeping a waiting list, we’d be sold out before we even harvest honey. It’s class time here! Stephen and I will be starting “bee school” tonight. I am so excited. When the classes are done, we’ll each have our local and state certification for beekeeping. Now it looks like I just need to find myself a bee suit. . . 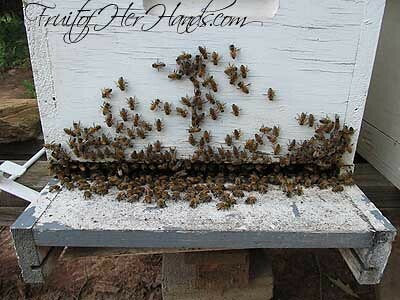 Bees bearding – they often do this on hot nights to cool down the hive. I think it’s fascinating to watch, and interesting to consider that they will “sleep outside” when it gets too hot inside the hive. We harvested more honey over the weekend. It was probably the last super we will take off the hive for the year. They’re still bringing in a good bit of pollen, but we want to make sure the hive has enough honey stores to make it through the winter. 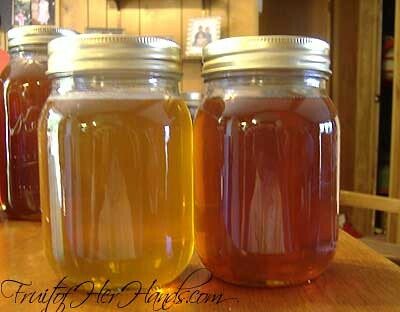 Here you can see the different colors of honey we’ve gotten from the same hive. It’s amazing the color difference, but the flavor difference is pretty drastic too. 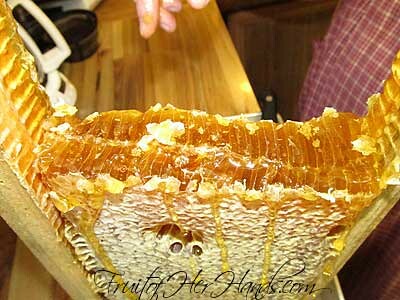 The darker honey is very strong flavored, and the lighter honey is very mild. We prefer the lighter ourselves. 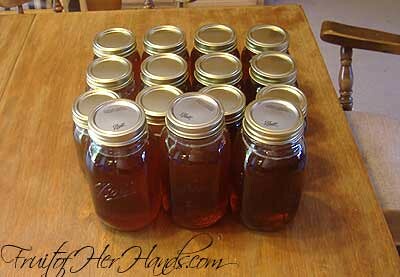 This is the amount of honey we got from the first super of honey I blogged about a couple weeks ago. We now have the bucket filled again, and we need to get some more jars so we can bottle it as well. What absolutely blows me away is that most of this honey is spoken for already. It’s amazing how once people find out you’re a beekeeper, how quickly they line up to buy the honey. Stephen said he has a customer at work who wants an entire gallon of honey! I’m not sure if we’ll have enough for her to get an entire gallon, but we’ll see. Stephen also got some really neat pictures when he was examining the hives. I like this one – he took it right after he removed a couple of frames to examine them. 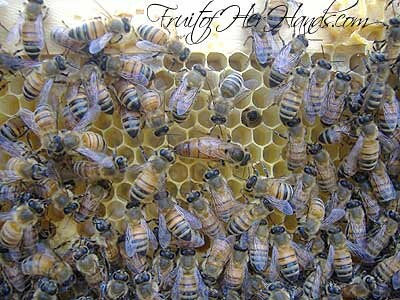 Can you find the queen in this picture? She’s the bigger, lighter colored bee right in the center. 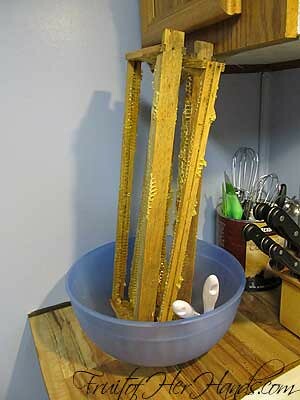 When the wax in the honey strainer bucket was pretty much done filtering (see here for the first post on processing honey), we put it in a pan and set it on the porch so the bees could take the last of the honey from it. There were a TON of bees on that wax. We really enjoyed watching them from inside the house, but Stephen went outside and took a short video. It was neat to see how clean the wax was when they were done! 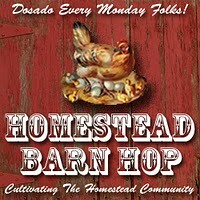 This post is linked to the Homestead Barn Hop. We started working on harvesting honey today. Our home smells amazing. There have been some questions asked about the process we use, so we took a lot of pictures this time. This is the super we’re harvesting today. 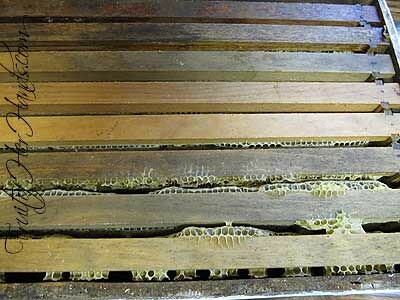 Each layer in a hive is called a super – it is a box of frames that the bees build comb in. We have 8-frame hives, because the supers are easier to lift than ones with 10 frames. 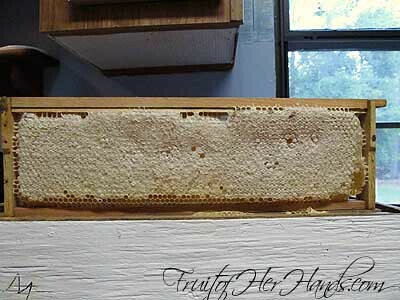 This particular hive had three honey supers on it, but we only took one to harvest today. Our honey straining bucket can’t hold the honey from all eight frames at once, so this super will probably take most of the day to deal with. Here’s a look directly down inside. Here’s a look at a frame that is ready to harvest. 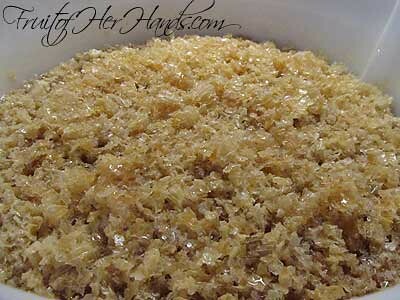 The white coating is a thin layer of wax (cappings) that keeps the honey from oozing out. We take a frame at a time, and cut the comb off with a bread knife. We’ve found it’s easier to cut it into two or three sections, just so it doesn’t fall on the counter and make a huge mess. Then we take a pastry blender to crush the comb. 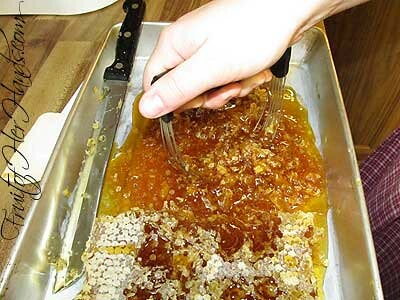 We use the crush and strain method (more info at the blog Linda’s Bees) because we like to use the filtered wax for other things. Then we pour the crushed comb into our straining bucket. The filter holds about three frames’ worth of honey. The empty frames get placed in a bowl to drain further. When they’re pretty much done, we’ll set them outside for the bees to finish off. 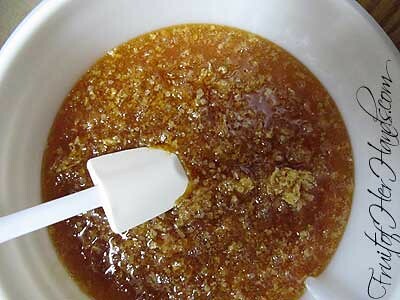 They’ll take the last of the wax and honey back to the hive and reuse it. After about an hour, the wax has filtered pretty well. It’s not done yet, but there’s definitely progress. 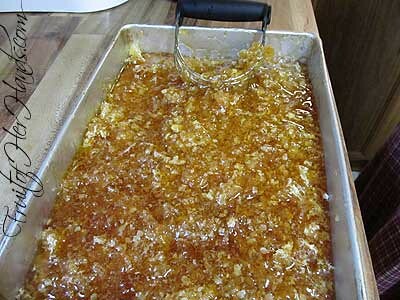 When the wax is completely filtered, we’ll rinse it and put it in the freezer for later use. 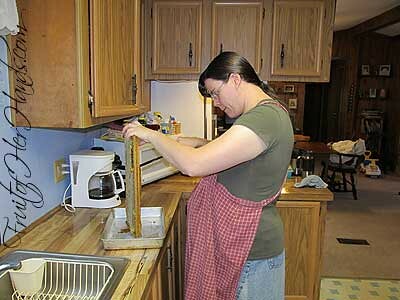 The next step is pouring the filtered honey into jars. We probably won’t get that far today. We will wait until the bucket is mostly full first – right now the honey is about two inches deep in the bucket. It filters pretty quickly but doing all the frames will probably take most of the day. 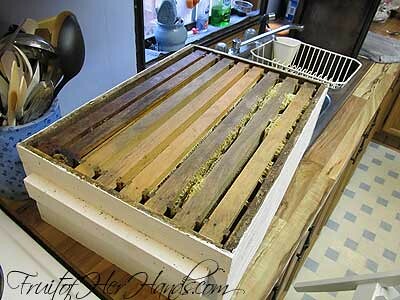 The main project for today is to get the comb crushed and filtered. It’s sticky and messy, but the end result is so worth it.